I have two very different moms to buy for each year. I have my mom who is an independent, adventurous hippie that loves all things organic and traveling. Then I have my mother-in-law who is a retired nurse that adores cooking and quilting. Talk about two ends of a mom spectrum but they both help me stay open to understanding that moms are all different but tend to enjoy similar things- time with family, things that make them feel special and things that make them feel beautiful. I have put together this list of items that have been hits with the ladies in my life. Barefoot Dreams Cardigan– If you haven’t picked one of these up for mom yet just do it! It is so soft and snuggly but classy enough to also wear out of the house. I’m dying for the new burgundy color and with my mom’s green eyes and dark hair I have a feeling she will want it too. By Terry Baume de Rose Lip Care– Now this is probably something she would never buy herself because it’s on the pricy side but this luxurious lip balm is thick, moisturizing and has the lightest scent of rose. I bought mine at least 8 months ago and use it almost daily so it does last a long time. J.Jill Andrea Sweater Tunic– My MIL loves J.Jill and I can understand why! They have high quality, flattering tops that look classy and age appropriate for moms. This tunic is great because it can be dressed up or down depending on what she has going on in her day. Black and Decker Helix Hand Mixer– Now I will tell you I don’t own this and neither do my moms but I saw it on the Oprah List and girl I want it! I know that both my moms love cooking but don’t always love lugging out their big mixers for a fast recipe. That’s where this helix designed beater comes in because it mixes 2x faster! Rose Gloves– I am lucky that I have gardeners on both sides of my family so digging in the dirt is always a favorite past time. These hardy rose gloves come up high on the sleeve to protect her arm but are soft and pliable to easily work in. 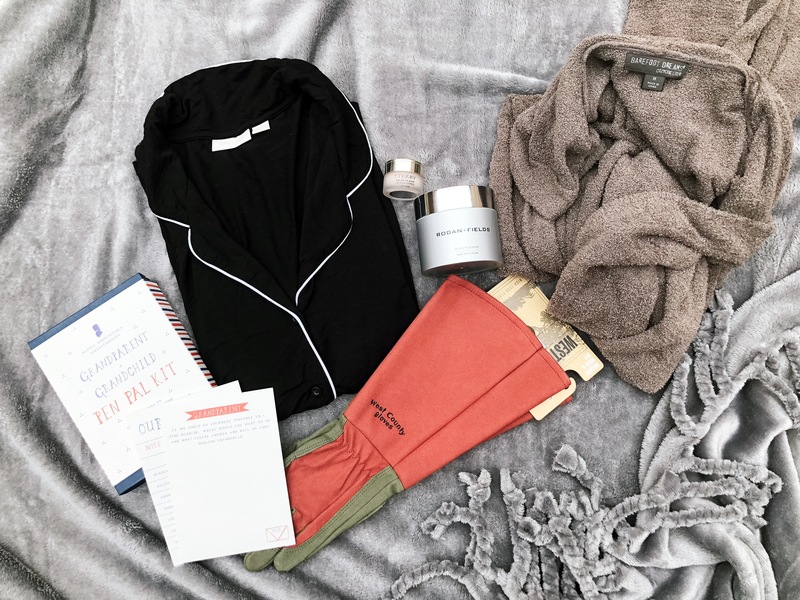 I linked the small size but they do come in XS-L.
Nordstrom Moonlight Pajamas– I have the shorts versions of these silky, soft pjs if you like Soma these feel exactly the same as their cool nights line. These come in 8 colors so you can find one that will fit your mom. Rodan + Fields Active Hydration Body Replenish– This body lotion came out earlier this year and in that time I have gone through 2 tubs and my MIL has as well. This lotion uses a concentrated solution of Hyaluronic Acid and Glycerin that draws in moisture from the atmosphere and locks it onto skin, this fast-absorbing formula restores skin to its optimum hydration level. Talk about mom’s dry skin problems resolved! Kennebunk Bliss Plush Throw– This ultra soft but still light weight is the perfect throw blanket for lounging on the couch. If mom is reading, quilting or just watching the news this throw has 20 colors to match her decor. Wood Block and Prints– I’ve realized that parents like printed pictures, sending it on the phone just doesn’t have the same feel for them so pick your favorites from this year and have them printed on this high quality cardstock (12 prints are included) then the wood base displays them all year. This way they can flip through your smiling face! Grandparent Pen Pal Kit– There is nothing like getting a letter in the mail when you are a kid! This cute set has stationary for letters to and from their grandparent with games and ideas on what to write.